A Land Full of God gives American Christians an opportunity to promote peace and justice in the Israeli-Palestinian conflict. It shows them how to understand the enmity with brief, digestible, and comprehensive essays about the historical, political, religious, and geographical tensions that have led to many of the dynamics we see today. All the while, A Land Full of God walks readers through a biblical perspective of God’s heart for Israel and the historic suffering of the Jewish people, while also remaining sensitive to the experience and suffering of Palestinians. The prevailing wave of Christian voices are seeking a pro-Israeli, pro-Palestinian, pro-peace, pro-justice, pro-poor, and ultimately pro-Jesus approach to bring resolution to the conflict. Hear Mae speak about A Land Full of God on the Red Letter Christian podcast. 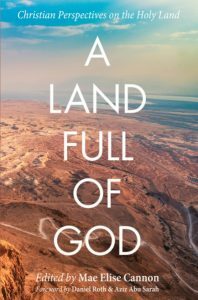 A Land Full of God is one of Fupping’s 6 Must-Read Books on the Israel-Palestine Conflict. *Disclosure: This link is an affiliate link, meaning, at no additional cost to you, Churches for Middle East Peace will earn a commission if you click through and make a purchase.